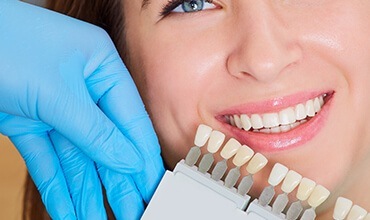 Teeth whitening is one of the most common cosmetic dentistry options available today, and for that reason, there’s a wide variety of products and techniques that are available to patients who are looking to achieve a brighter sheen to their smile. How do you know which is right for you? At Dr. Ronan Freyne’s office, we believe that receiving professional-grade care from a well-trained dentist is the safest and most effective way to achieve the results you’re looking for. Please contact our Chevy Chase, MD location today if you’d like to schedule an initial consultation, or if you have any questions for our team. Do you have a big event coming up, like a wedding or a graduation ceremony? Is speed your biggest priority for your cosmetic improvements? Then in-office teeth whitening with KoR could be the best choice for you. This procedure is performed over the course of one to three appointments, depending on severity of tooth discoloration, here in Chevy Chase, with Dr. Freyne applying high-grade whitening gel to the surface of the teeth. Patients should see immediate results, with their smile being lightened multiple shades by the time they leave our practice. If you would prefer a more gradual and flexible approach to your whitening improvements, a custom take-home kit might be the better choice. These services consist of custom bleach trays that have been personalized for your unique mouth, as well as professional strength whitening gel. The patient’s job is to wear both components together for a certain amount of time each day. Within a few weeks of consistent use, patients should see noticeably brighter results. Our team offers both KoR take-home whitening kits and Philips Day White, which only has to be used for a span of 15 minutes two times a day.